awesome post! i got my first mac paint pot yesterday - glad to know that it's good for oily lids! I've used UDPP but I never repurchased because I can't get it locally. I use a paint pot, and it works great, even with nothing underneath. I once wore it beneath shadow for 21 hours and no creasing, just some fade. @ Alexa P.. I hope you like your Paint Pot!! @ Pamela.. I want the tube too but can't get myself to buy it since I have like 3 tubes of UDPP! tThe tube would definitely be more efficient than the genie bottle. wow !!! u know i love Paint Pot the most as primer and then UDPP. I also have Too Face Shadow INsurance LOL. I got an oily lid so primer is a must! Great comparisons! 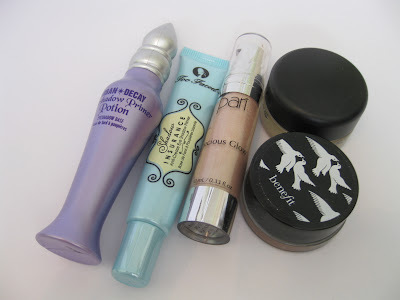 I have been trying to decide if I want to try UDPP or too faced to replace what I am using now (Benefit stay don't stray)and this has definitely helped.